PoopPac all-in-one dog walkers bag, dog poop bag holder and dog waste bag dispenser. Designed for dog walkers to carry used Poop bags odor free, and to dispense new dog poop bags. What Is PoopPac Dog Walkers Case? PoopPac Dog Walkers Case is an award winning stylish case designed to carry your used dog waste bags, and dispense new dog poop bags when you are out walking with your dog. This case is a great dog walkers accessory for times such as beach walks, hiking and traveling with your dog. 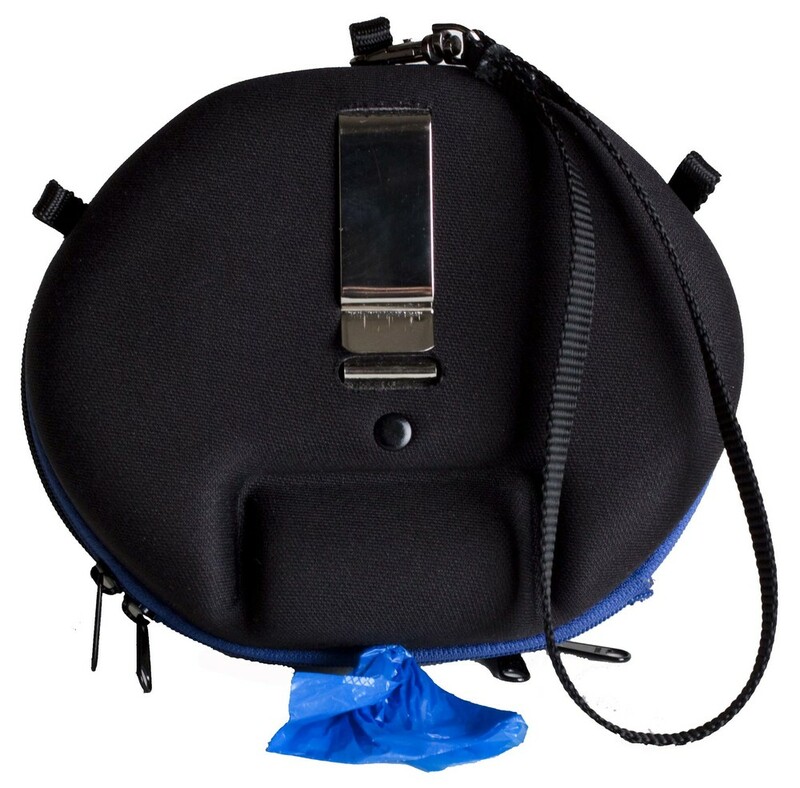 PoopPac Dog Walkers case is a stylish, unisex, convenient and practical way to manage your dogs waste bags and used dog poop bags when walking and traveling with your dog. Our all-in-one dog waste bag holder, dog waste bag dispenser and dog walker's bag is designed to both carry used dog waste bags odor free, and to dispense new poop bags. 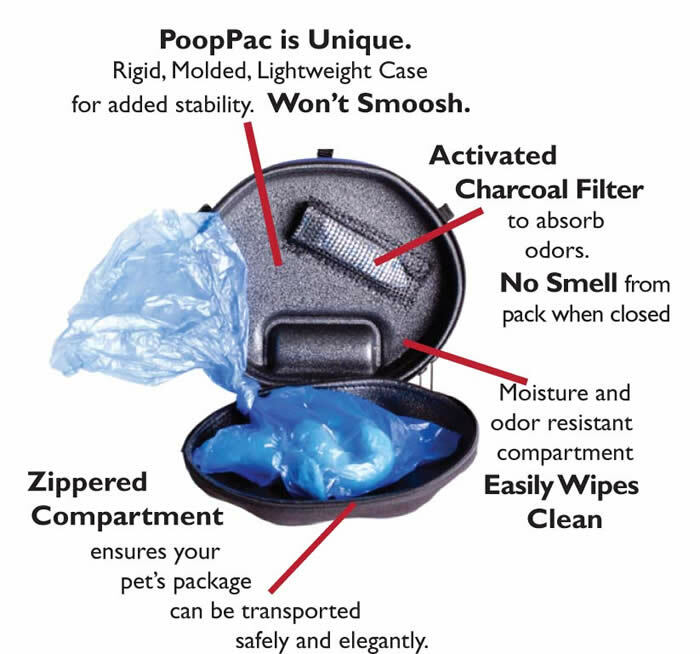 PoopPac has many features that will enhance your dog walking experience. When we are walking our dog on the beach, hiking with our dogs, or traveling, it is often challenging and distracting looking for convenient suitable trash cans to dispose of our pets waste. On top of this, running out of dog waste bags can also be a challenge and bagging and carrying the used dog poop bag can be smelly and inconvenient; especially if you are juggling more than one thing; coffee, children and other items requiring your hands... Accordingly we designed our award winning patented all-in-one dog waste bag holder, dog waste bag dispenser and dog walker's bag, to manage your new and used waste bags whilst out-and-about, leaving you worry free, odor free and and most importantly 'hands free' to enjoy your walk! 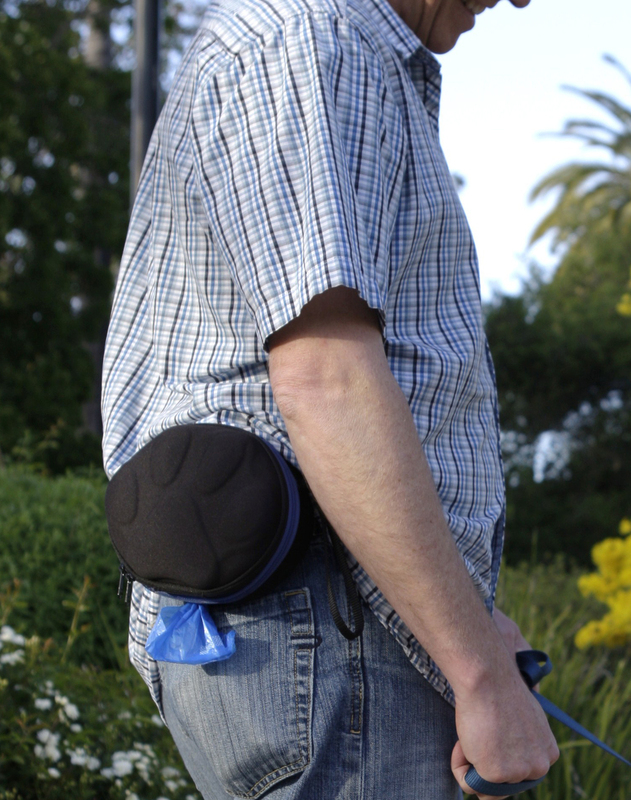 Adjustable Shoulder Strap allowing you to carry the PoopPac over your shoulder, across your chest, or behind you; back-pack style. Front water resistant compartment doubles as a convenient water bowl (yes it works as the non-porous foam does not retain odors...). Also handy for carrying those wet, dirty tennis balls!